As the year winds to a close, I’ve been looking over what I’ve put out on this blog and how it has been received. I’ve never claimed that I’ve written for anyone other than myself, but to know that there’s an audience for what I produce is wonderful and incredibly humbling. To everyone who has read, shared, enjoyed, or supported me in this endeavour in some way over the last 12 months, I offer you my most sincere thanks! It has been brilliant! … You’ve been brilliant! We’ve been brilliant together! Drumclay Crannog: a site in a post-truth landscape? According to many commentators, we now live in an era of ‘post-truth’ or ‘post-factual’ politics. We have seen it in action in the US with the election of Donald Trump and in the UK with the pro-Brexit campaign. I had presumed that it was largely confined to that political realm and had not entered other aspects of our lives. 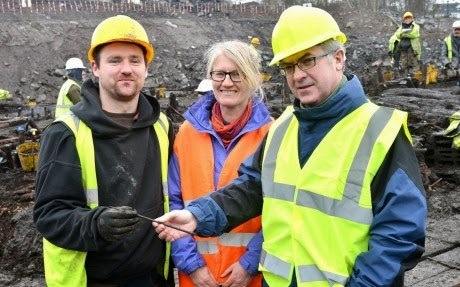 My naivety on this matter was rudely shattered recently when I saw a piece from The Fermanagh Herald reporting that the consortium behind the A32 Cherrymount Link Project had received an award for their handling of the excavation of Drumclay crannog. I’m not particularly familiar with The Fermanagh Herald, but I still had to check to ensure that it wasn’t affiliated in some way with such reliable news outlets as The Onion or Waterford Whispers News. But, alas, no. The Fermanagh Herald is, as I suspected, a real newspaper that was reporting on a real event. On Monday 28 November last the CEEQUAL Outstanding Achievement Awards 2016 were held at the Institution of Civil Engineers in London and the group behind the road scheme (Roads Service NI, Amey, and McLaughlin & Harvey/PT McWilliams JV) waked away with a Highly Commended award in the ‘Historic Environment’ category. The Fermanagh Herald piece noted: “[the] judges ... who recognise and celebrate projects that represent best practice performances in a particular field of civil engineering, commended the project team on their approach to the rare and important finds, stating the project received exceptional support in preserving this significant site. The judges were impressed by the lengths the team went to, not only to preserved (sic) a nationally significant artefact but also to support the wide dissemination of the findings to schools and the wider public". This bears fudge-all resemblance to the facts. If I understand it correctly, CEEQUAL based their assessment on a written submission by Charlene Jones of McLaughlin & Harvey (one of the partners in the road scheme) [here]. This was then verified by Dion Williams of Doran Consulting. According to their website: “Doran Consulting offers a wealth of expertise and experience in the creation of economic, innovative and sustainable engineering solutions. Doran Consulting’s skilled and committed workforce provide civil, structural, CDMC, water, waste water and traffic engineering expertise and other specialised advice and consulting support to a wide client base both nationally and internationally.” I’m sure that are ably qualified to consult on all and any of these matters, but I wonder how thorough their process of verification really was. Was it just confined to correcting spellings and grammar? … ensuring that the document used consistent justification to the left margin, perhaps? Maybe they insisted that all the section headers were in bold and at the same point size? It must be something like that, because it certainly didn’t involve all that much in the line of fact checking. “Really?”, I hear you cry! Well, let’s take a closer look at some of the claims here. “The only method of determining the exact location was to de-water the site and commence investigation works.” I can find no nicer way of addressing the inaccuracies in this statement (without resorting to profanity) than saying that it’s utter nonsense and can only have been written by someone entirely unfamiliar with the planning and excavation history of the site, or one attempting to mislead the reader. The truth of the matter is that archaeological test trenching was carried out on the crannog in January 2011 and Declan Hurl’s ill-fated Phase 1 excavation began in July 2012. The excavation of the surrounding land and dewatering of the area had begun in April 2012 – three months previously. Even in my interview with Amey’s Rodney Moffett, he never once intimated, claimed, or suggested that the dewatering was anything other than an engineering solution. There was no suggestion that the dewatering was carried out as an aid to the archaeological excavation. Even Declan Hurl’s vastly self-serving and rose-tinted open letter (“Apologia Pro Excavatio Sua”) makes no such outrageous suggestion. Instead, it is clear that the dewatering programme was distinctly and directly responsible for substantial damage to the archaeological site. In a paper to the Institute of Archaeologists of Ireland it was noted that “The water levels around the crannog were lowered following road excavation works which evidently left the site drying out and exposed. The solid material … sank. The northern part of the site showed significant large cracks to 6m in depth when inspected.” This is reiterated in Prof. Cooney’s report, where he explicitly links these works to the partial collapse of the site. The evidence is clear – there was no relationship between the dewatering of the area and the archaeological excavation, other than a negative one. These works partially destroyed the archaeological site and were not conceived of nor implemented as an aid to the excavation. Just so we’re clear (and to help anyone not completely conversant with the history of this debacle) the planning and early excavation history (Phase 1 excavation) of this internationally important crannog (early medieval lake dwelling) was such an unmitigated disaster that it required direct intervention by a government minister – Alex Attwood, the then Minister for the Environment – to insist on a properly funded excavation (Phase 2 excavation) with an appropriate timescale. Part of Attwood’s direction was to commission Prof Gabriel Cooney of UCD, and Chairman of the Historic Monuments Council, to write a report on the conduct of the planning process and Phase 1 excavation so that disasters like this could never happen again. “From the outset of this project McLaughlin & Harvey/PT McWilliams liaised with the NIEA as to the initial locating and investigation works of the Crannog, which then progressed to a preliminary archaeological dig to determine if this was a viable Crannog settlement.” Prof. Cooney’s report noted that “A key shortcoming in the process was that EHS (as it was then) [NIEA] does not appear to have been consulted either on the Scheme Assessment Report Stage 2: Preferred Options Report (June 2007) or on the Environmental Statement (September 2007)”. To my mind, at least, it is clear that, had there been early and substantive consultation with the NIEA, much of the Phase 1 excavation omnishambles that followed could have been avoided. Admittedly, Rodney Moffett has attempted to rebut this point. He is on record saying: “Prof Cooney misses the fact that RPS liaised with the NIEA between 2006-2008, which is unfortunate and disappointing. Prior to that, Scott Wilson (who were another consultant who are now Aecom) liaised with NIEA, as I understand, looking at the line originally.” In the same interview, he noted that this point had been raised with the Department of the Environment. To date, no evidence that I am aware of has entered the public realm to substantiate this claim. 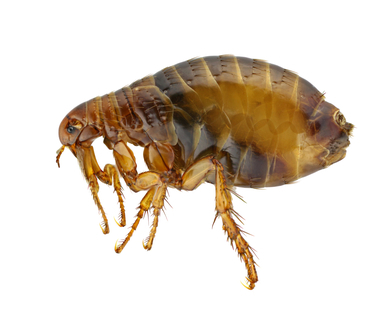 Until such time as it does, it seems reasonable to treat the similar claims presented in the CEEQUAL submission with a certain amount of intense scepticism. “At this stage [the dewatering of the site] the road design was to include for the Crannog, with no disruption to the structure. 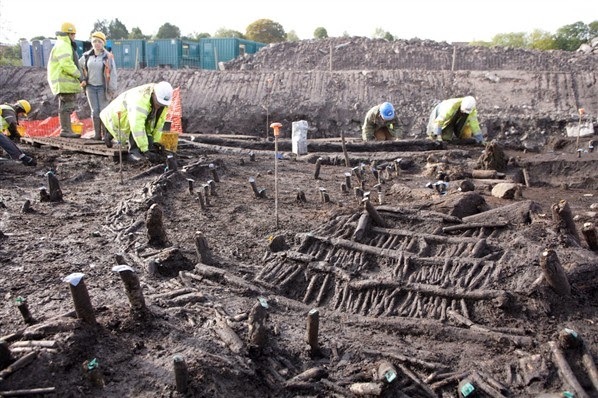 [¶] However, the initial archaeological findings being that the Drumclay Crannog was artefact rich, and had potentially settlement finds dating back thousands of years. Due to these findings it was then agreed that the Drumclay Crannog would have a controlled full excavation, with archaeological logging of this structure step by step to determine the Crannog construction make-up and insight to the living conditions, materials and tools used by its settlers.” Soooo … the narrative being peddled here is that the dewatering was to help the excavation of the crannog. At the same time the plan was to create a bridge/raft over the site so it didn’t need to be excavated at all. But, at the same time it was because of the great finds and preservation that the whole site had to be excavated. As was noted in the paper presented to the IAI “The site of the crannog was to be bridged according to the Roads Service. The Roads Service claims that this methodology was agreed with the NIEA. 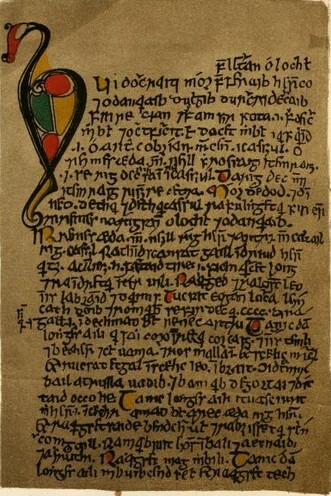 It is clear from the methodology outlined in this document that the crannog and its environs would be unlikely to survive these alterations to the environment in which it was preserved.” Basically, the considered consensus was that the attempt to preserve the crannog in situ using a raft or engineered bridge was flawed and doomed to failure precisely because the dewatering of the area had cause damage and would eventually result in the complete destruction of the site. Prof. Cooney noted that by late 2011 NIEA were attempting to impress upon the consortium “the high cost of excavating a crannog and the inherent difficulties of piling/rafting over the crannog.” He goes further to argue that “It does not appear that RS/Amey and from late 2011 MHPT JV had a coherent or consistent strategy to mitigate the impact of the road on the crannog”. 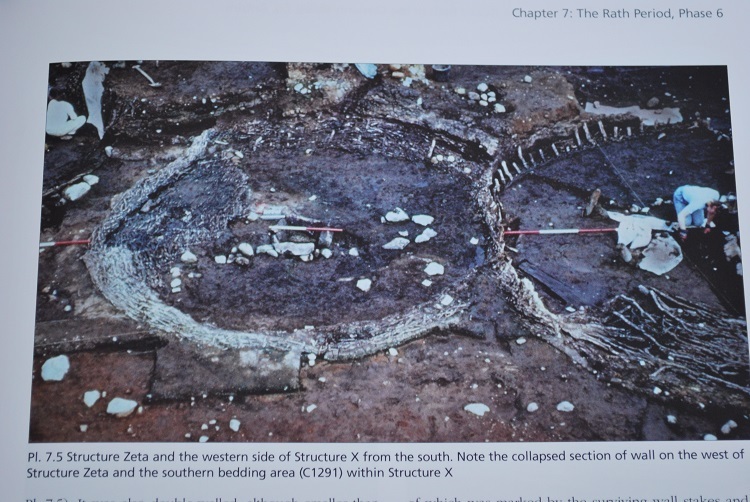 The Phase 1 excavation, directed by Declan Hurl, attempted to minimise the importance of the site and the findings there and scheduled a brief excavation, expected to last a mere six weeks. It was only through the vocal advocacy of a broad range of professionals and passionate non-specialists that brought public and political scrutiny to this deplorable situation. The evidence is clear that without this external intervention the Drumclay crannog would have been inadequately excavated and recorded, and quickly disposed of. This dismissive attitude towards the site was maintained by Declan Hurl – the archaeologist directly employed by Amey, the engineering firm – as late as Autumn 2015 when his dyspeptic “Apologia Pro Excavatio Sua” was published in Archaeology Ireland magazine. In this he described the site as “a disintegrating mound in the midst of a construction site with serious time pressures.” and “a potentially crumbling mound in the middle of a drained and cracking bog surrounded by construction plant.” While it may be granted that the statements in the CEEQUAL submission are, broadly, correct, they are so selective in their wording as to place them on only the most nodding terms with the actual situation. “McLaughlin & Harvey/PT McWilliams cooperation was paramount to the archaeological dig, hence the road construction programme was stalled within this area, and when required, mechanical assistance was provided.” I’m genuinely finding it difficult to read through this without laughing. It’s clear what they’re doing here – they’re spinning every fact into a positive because they want to take home the award! The author must also have presumed (hoped?) that no one with any knowledge of the actual facts of the excavation and planning history would ever read it. True, the contractors on site did cooperate with the archaeologists and provide necessary assistance … up to a point. They were responsible for unlicensed trenching through the site while the site director was on another job in England. Cooney puts it bluntly: “Under the terms of Article 41 of the Historic Monuments and Archaeological Objects (Northern Ireland) Order 1995 Amey acted illegally in undertaking mechanical excavation of trenches on FERM 211:061 in February 2012 and presenting this under the auspices of an archaeological excavation license, AE/10/199.” Rodney Moffett would later attempt to spin this as a communications error between the Amey engineers and the NIEA representatives in that it was not made clear that this should have been carried out under archaeological supervision. While I have been lacerating in my criticism of NIEA failures of action and leadership in the past, this is one area where I fail to find them wanting. As I’ve said before: “It’s an archaeological site and the company has an archaeologist on staff – why could you possibly think that this is not an archaeological issue? It’s not like Amey have never dealt with archaeological sites before. As Rodney Moffett says later on in the interview: “this is not the first site that archaeology has been on … we’ve done several …” … well, if that is the case, why wasn’t there even a basic understanding that these works should be archaeologically monitored?” Even if we ignore the fiasco of the Phase 1 excavation, and concentrate on the properly run Phase 2 excavation, the idea that the construction firms should receive special mention and acknowledgment for their assistance is laughable. Why? Well, simply put – it’s because they’re legally obliged to do this as a condition of their planning permission. Put it this way … I went out in my car yesterday afternoon. I wasn’t drunk, I adhered to the speed limits, and I singularly failed to run over any pedestrians on the footpaths. Aren’t I great? Now gimme my prize! No? Why? Because that’s what you’re meant to do! Sure, there are different levels of help and assistance you can receive from construction workers. 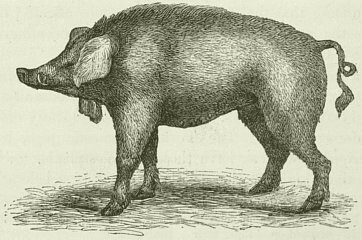 In my time in commercial archaeology I encountered a wide range of them from obstructive, unmitigated swine to those that lived up to their legal obligations. Sure, the latter are great, but they’re doing nothing more than that which is required of them. While Rodney Moffett’s interview with me consistently attempted to spin towards the most positive interpretations and explanations, he never once tried to suggest that the construction consortium ever went above and beyond in their attempts to assist the excavation. 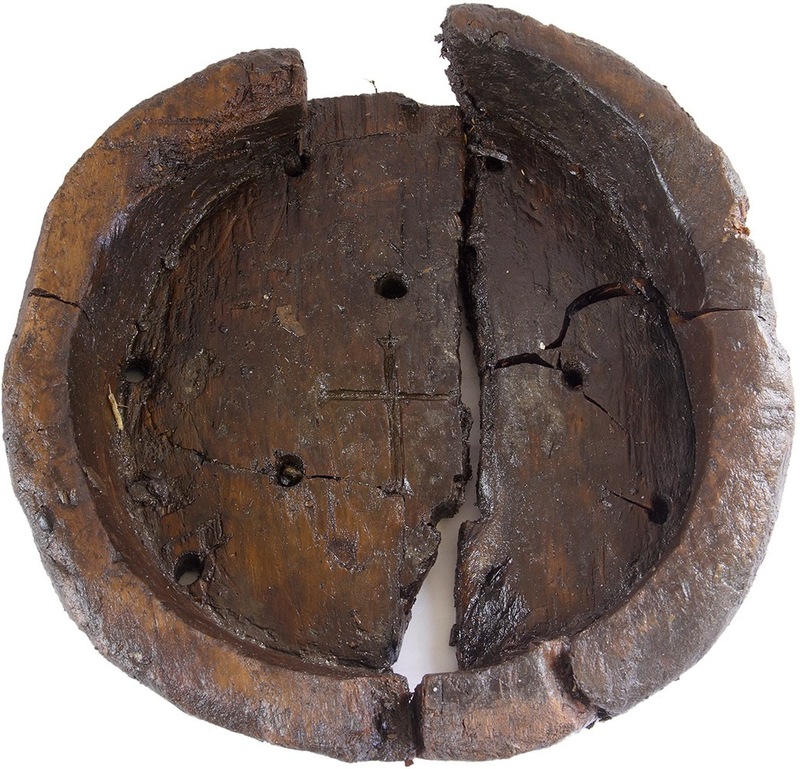 “These fascinating finds led to the Crannog being publicised nationally on the television and on the radio on numerous occasions.” This is true … there were great finds, it got on TV and radio. Even Prince Charles and Camilla came to have a look. But this still bugs me. The reason that the Drumclay crannog initially ended up on TV and radio was not through the wonders of the finds. At the very start, the only reason that the site received any coverage was because a number of people vocally and vociferously campaigned for the excavation to be given more time and funding. The responses that we were getting from NIEA and Declan Hurl (as Amey’s on site archaeologist) was that the site was nothing special and would be adequately resolved within the allotted six-week timescale. It was only after the then Minister of the Environment, Alex Attwood, visited the site and was convinced of its importance that positive change was effected. While the wording is literally true, it distorts the truth and misrepresents the actual events to the point that they bear no real relation to the facts. The downloadable 2016 Outstanding Achievement Awards PDF booklet notes for Drumclay that “They [the judges] were impressed by the lengths the team went … to support the wide dissemination of the findings to schools and the wider public.” Again, there is much truth in this. A series of excellent open days were organised [here], along with a very well attended one day conference in Enniskillen [here]. What the statement fails to acknowledge is that there is a vast amount of post-excavation work yet to be completed before the site can be properly analysed and published. While the engineers and construction folks are getting together and awarding each other prizes, this fact is being ignored. Let’s be clear here – I’m not suggesting that every sentence in the CEEQUAL submission is a lie. I’m more intimating that there’s selective reporting, obfuscation, and a certain inclination towards the disingenuous throughout. But why does this matter? At its simplest level, it suggests that Doran Consulting failed to do their job of verifying the submission well or even at all. It suggests that CEEQUAL have damaged their reputation by awarding a prize to a troubled project, thus giving some veneer of undeserved success. I would even go so far as to suggest that it should be a matter of concern to the other winners at the CEEQUAL awards. If one of the nominees can be demonstrated to having massaged the facts sufficiently to get a Highly Commended out of this, it can only raise questions about the value of the actual winners. From a wholly archaeological perspective, this is a depressing and worrying development. It allows Amey, and any other engineering firms watching, to walk away feeling that this deplorable situation was not just a success, but one that deserved to be awarded prizes. OK, maybe not the top one, but it still got Highly Commended! Where are the lessons learned? Where is any acknowledgment that this was a less than perfect situation? Where is there any indication that the fiasco of the planning and Phase 1 excavation at Drumclay will not be allowed to happen again? As we have seen elsewhere, allowing such post-truth narratives to progress unchecked is damaging to our political and economic wellbeing. By the same token, allowing this factually unencumbered award to go unprotested and unremarked damages us all. Most especially, it damages our heritage and normalises its depreciation by elements who then seek to congratulate themselves on a job well done. An initial response was received from CEEQUAL at 17:59 on 22/12/2016, acknowledging receipt of my request and promising one after the Christmas season. 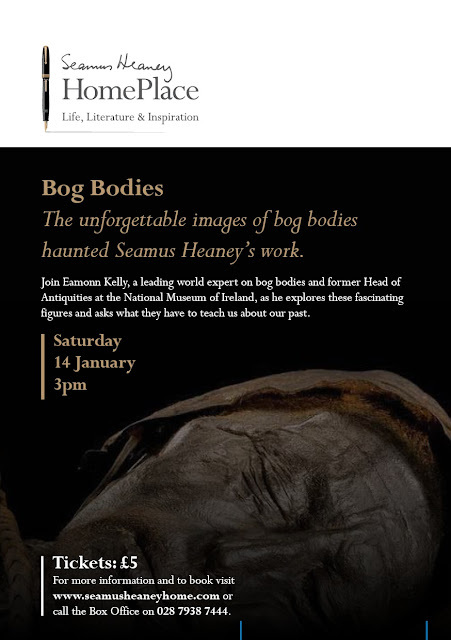 The unforgettable images of bog bodies haunted Seamus Heaney’s work and in the first talk of the centre’s new 2017 season, Eamonn Kelly, a leading world expert on bog bodies and former Head of Antiquities at the National Museum of Ireland, will be exploring these fascinating figures and asking what they have to teach us about our past. It’s that time of year again … the evenings are dark and cold … we’ve put up the tree and are listening to carols … you’re writing Christmas cards … and Chapple is poring over financial statements for several archaeological consultancies … it’s tradition! 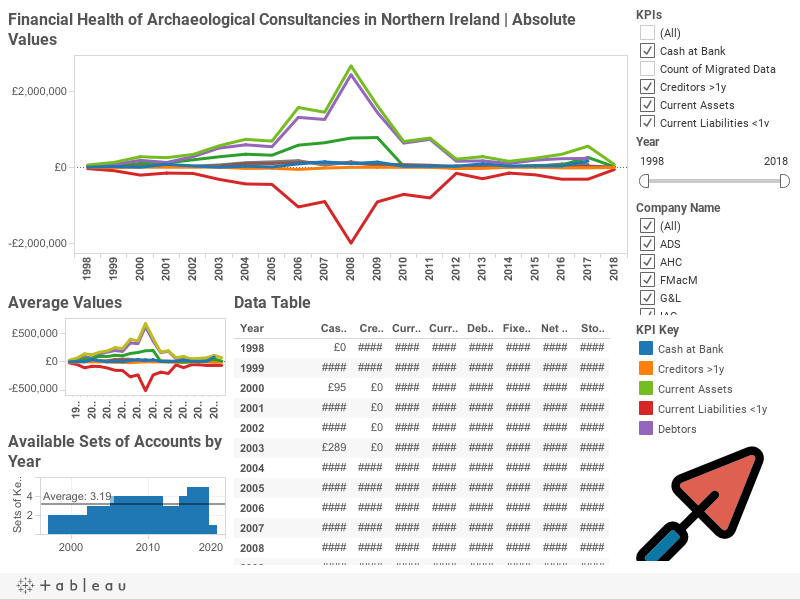 Since 2014 I’ve tried to keep tabs on how the commercial archaeological sector in Northern Ireland is faring financially [here | here | here]. Initially, the data went from 2007/2008 to 2013 and was presented as a series of static tables and graphs created in MS Excel. As I have added in the latest data when it became available, I have also endeavoured to push back the start date, to provide the most complete portrait possible. Now the data goes back to 1998 for one company and their earliest sets of accounts for each of the other three consultancies operating in Northern Ireland. I have also moved away from the static graphs to a dynamic, interactive visualisation of the data, created in Tableau Public [here and at the bottom of this post]. The original legal advice I was given was that, for the purposes of transparency and accountability, I should be open and positively identify which company is which. I, for a number of reasons, shied away from this direct approach and elected instead to identify each company only by its year of incorporation. Anyone wishing to go deeper into the data would have to go to a separate appendix and make the connections manually. However, for this new edition, I have been persuaded that such an obfuscation is neither necessary nor desirable. A number of people have put it to me that it is unnecessary as everyone clearly knows which company is which and continually referring to them by code is simply annoying. Archaeology Development Services have not submitted any end of year accounts since 2011. Their Facebook page has not been updated since June 2014. The CompanyCheck website currently [Dec 2016] lists them as ‘In Liquidation’. The UKCorporateList website gives the status as ‘Voluntary Agreement’. The UK Government website describes a Voluntary Agreement as one where a company is insolvent but an agreement is reached with creditors to allow them to remain trading while they attempt to pay their debts. The checkbusiness website gives their status as ‘Winding Up Order’. All these websites appear to deal with the portion of the business operating in the United Kingdom. However, the SoloCheck.ie website (reporting on the company operating in the Republic of Ireland) gives their Current Status as ‘Normal’. Nonetheless, their adsireland.ie website (listed on Facebook and LinkedIn) cannot be reached. Earlier attempts to call them have received no answers. Taken together, it seems that they have gone out of business … no detective awards coming my way for that! However, I have not been able to ascertain the ultimate fate of the contents of their storage and processing facility in Kells, Co. Meath. 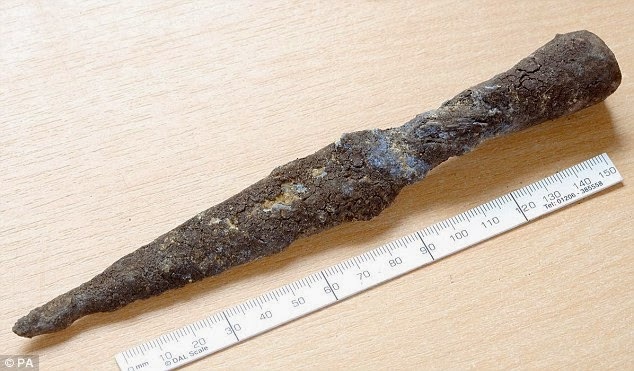 Eoin Halpin, one of the company directors, gave an interview to the BBC in 2014 that talked about the “Hundreds of thousands of archaeological items recovered from historic sites in Northern Ireland are lying unclassified in plastic bags and boxes”. If the company has closed for good, what has become of all these artefacts, ecofacts, and site archives? Unfortunately, my earlier attempts to gain answers from the NIEA may, at best, be described as ‘unhelpful’. For the purposes of this post, I have removed all ADS data from the discussion, concentrating solely on the financial histories of those three companies still active. If we sum up all the financial activity of the tree remaining companies, we see that 2015 was a mixed year, with relatively little to celebrate. The three companies had all of £22,638 (Av. : £9,213) cash at bank. This is down from £29,238 (Av. : £9,746) the previous year and is small beer in comparison to the high of £140,071 in 2007 (Av. : £46,690). Current Assets are up to £230,593 (Av. : £76,864) from £154,395 (Av. : £51,465) the previous year. Again, this is a small-scale recovery (itself down from the 2013 figures) and nothing in comparison to the 2008 high of £769,124 (Av. : £256,375). However, it must be kept in mind that substantial portions of these Current Assets are made up of the amount owed to these companies by their Debtors. While it is undoubtedly great to be owed money, this form of wealth is somewhat less than stable and secure. While the percentages vary between the three companies (from c.70-93%), it is in all cases a substantial proportion of their Current Assets, and there is little here to bring comfort. At the end of 2015 the combined debtors for the three companies came in at £184,984 (Av. : £61,661). This is markedly up from the previous year’s total of £98,657 (Av. : £32,886), but once again significantly below historic highs of £551,062 in 2007 and £545,761 in 2008. While an increase in the amount owed to the companies by their Debtors is indicative of more work being completed, it is also of concern as it represents monies as yet unpaid. On the positive side, the accounts indicate that none of the companies owe longer-term Creditors (> 1 yr), recovering from historic debts of £36,788 (Av. : £12,263) in 2012. However, the total Current Liabilities (coming due within one year) owed by the companies at the end of 2015 was £196,274 (Av. : £65,425), an increase from £154,750 (Av. : £51,583) the previous year. This still represents an extraordinary recovery from the historic high of £303,985 (Av. : £101,328) in 2013. Total fixed Assets for the companies was valued at £9,580 (Av. : £3,193) at the end of 2015 and represents an overall depreciation in assets with little evidence for investment from the historic highs of £59,481 (Av. : £19,827) in 2007. The combined value of Stock/Other assets is given as £17,971 (Av. : £5,990). Once again, this is markedly down in the previous year’s total of £26,500 (Av,: £8,833), but above this century’s historic low of £7,000 (2011) and insignificant in comparison to the all-time high of £140,190 (£46,730) recorded in 2008. The bottom line is, of course, the combined Net Worth that gives an indication of the value of the sector as a whole. At the end of 2015 the total was £43,899 (Av. : 14,633) up from the previous year (£10,296) and well above the historic low of -£14,976 returned in 2013. Ostensibly, the figure shows a sector in recovery, though well below historic high of £537,276 (Av. : £179,092) recorded in 2008. If the 2015 figures do represent the first green shoots of recovery, it must be regarded as one that is fragile and uncertain. It in no way shows an industry performing at anything like its past peaks. It would be wrong to completely dismiss this as a hopeful sign, but it would be equally wrong to over hype it as solid evidence of real growth in the sector. Only time (and more data) will tell. While the combined and average figures go some way to describing the commercial archaeology sector as a whole, it is still worthwhile delving deeper into the data to see how each of the surviving companies have fared. Gahan and Long are run by Chris Long and Audrey Mary Louise Gahan. While 2015 was by no means spectacular, they survived and appear to have kept their heads above water. Their Cash at Bank was given as £6,217, up from £3,663 the year before, and £2,382 in 2013, but far below their historic high of £82,045 in 2006. There is a broadly similar story with their Current Assets, up year-on-year from £27,269 in 2013 to £87,693 in 2015, but much reduced from the £381,303 recorded in 2007. However, the period from 2013 to 2015 shows a remarkably close correlation between Current Assets and the monies owed to the company by Debtors. In 2013 Debtors owed £24,887, making up 91.26% of the Current Assets. By 2015 the figure owed by Debtors had risen to £81,422 and accounted for 92.85% of the Current Assets. To reiterate – it’s great to have won contracts and gotten jobs, but it’s less good when you’re still waiting to be paid for them. The value of Fixed Assets is given as £6,091 in 2015 and represents the latest in a long decline from a high of £37,008 in 2007. While Fixed Assets depreciate over time, it would appear that there has been no strong investment back into the company. While the value of Current Liabilities (payable within one year) had been declining from 2011 (£111,569) to 2014 (£85,870), they have taken a slight dive to £92,849 in 2015. While somewhat concerning, it is still much better than the debt of £144,995 recorded in 2008. From the accounts submitted, it would appear that the company has no outstanding Creditors to be paid back in more than one year, nor do they have any Stock or other assets. Gahan and Long only record a 2015 Net Worth of £935, but this is a marked improvement on the negative returns for 2013 (-£70,144) and 2014 (-£41,423). While there must be a temptation to celebrate this return to a positive net worth, the fact remains that this result is dizzyingly far below the ‘boom’ years of, say, 2007 (£280,440) and even 2009 (£257,938). My analysis would be that, while there is some evidence for a return to profitability, it is small and (in comparison to their best years) insignificant. 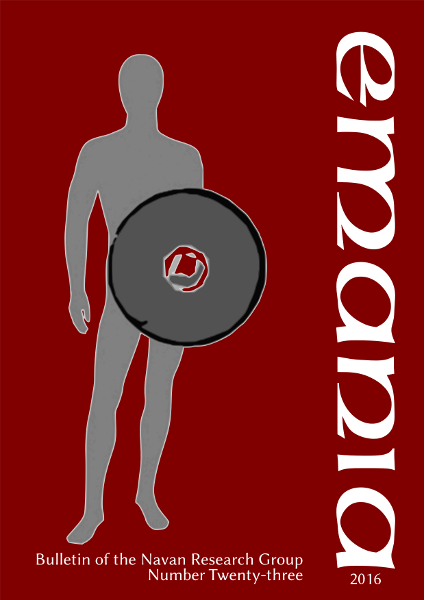 Christopher John Farrimond and Ciara Mary MacManus are the people behind FarrimondMacManus. All things considered, they didn’t have a bad year. Their Cash at Bank was £18,738. True, this figure is a significant decrease on the 2014 result (£24,041), and well below the £85,858 of 2013. Nonetheless, it is still the highest of any of the three companies in the sector for 2015. Current Assets are up to £74,439 from £37,421 in 2014. This is, of course, mirrored in the Debtors data, where the figure rose from £13,380 in 2014 to £55,701. However, in 2014 Debtors comprised c.36% of the Current Assets, and this has – rather worryingly – risen to c.75%. For 2014 and 2015 Fixed Assets have been valued at £0 – a long way down from the historic peak of £11,720 in 2010. At the very simplest level, this would suggest that there has been little in the way of investment into the company. On the other hand, Creditors falling due in more than one year have remained constant at £0 since 2013. Even when such did exist (2008 & 2010) they were very modest, in the order of £3,400. At the same time, Current Liabilities (payable in less than one year) have increased markedly to £34,995 from £7,750 in 2014. Again, this is much better than the 2013 figure of £90,585. Stock or other assets are listed at £0, and have been since 2011. Taken together, the Net Worth of FMacM is listed as £39,444. Although far below the £90,548 of 2008, or even the £61,611 of 2013, this is still a good result, making FarrimondMacManus (by far) the most valuable company in the sector. Finally, we come to Northern Archaeological Consultancy whose directors are listed as Alan Reilly, Stephen William Gilmore, and Colin David Dunlop. At the end of 2015 NAC had all of £2,629 Cash at Bank. This was a marginal improvement on the £1,534 of 2014, and especially the £325 of 2013, but far below the heady results of £49,531 recorded in 2007. Their Current Assets are £68,461, down from £78,525 the previous year and the £99,059 of 2013. Once again, these figures are all quite insignificant in comparison to the historic high of £308,049 from 2007. Again, the story of the Current Assets is tied to the company’s Debtors. In 2015 Debtors were valued at £47,861 and made up 69.91% of Current Assets. The value of the Debtors has been falling from £74,747 in 2013 (75.46%) to £50,491 in 2014 (64.30%). It is easy to suggest that a fall in the amount owed by clients is a good thing, indicating that the company has been successful in collecting debts. However, it may also be taken as a broad indicator of the volume of work undertaken by the company, and a three-year decline (paralleling the 2008-2012 economic downturn) can only be regarded with concern. Fixed Assets are listed at £3,489. This is down slightly from £4,653 the previous year and markedly so from 2007’s £20,923. This would suggest that the slight investment noted in 2014 has not been sustained and that it was but a blip in a larger, downward progression of non-investment since the beginning of the economic downturn in 2008. On the positive side, NAC list their Creditors requiring repayment more than one year in the future at £0 (the same as 2014). This is a major recovery from historic levels of debt in the region of £31-35,000 recorded in 2012 and 2013. The company’s history of Current Liabilities is rather more turbulent. At the end of 2015 these were valued at £68,430, an increase from £61,130 the previous year. All this is rather small beer in comparison to 2006’s £137,754, but the general trend since 1998 has been towards increasing levels of Current Liabilities. The value of Stock or other assets is given as £17,971. The period from 2012 to 2014 had seen this figure remain relatively stable, in the range from £24-29,000, and this represents a noticeable dip. Once again, these appear as minor fluctuations in comparison to historic highs of £132,010 recorded in 2008 and even £107,202 in 2006. Obviously, these variable results have a direct impact on the current Net Worth of the company. At the end of 2015 NAC’s Net Worth was listed as £3,520 – a massive and worrying drop from £22,048 the previous year. Indeed, the period from 2010 has been exceptionally unstable for the company, with Net Worth fluctuating between positive and negative valuations. These have ranged from 2014’s £22,048 down to -£23,735 in 2011. While the trend over this period has been (broadly) going upwards, the degree of volatility can bring little comfort or hope for security. In any case, these results are far below historically high Net Worth valuations of £200,667 in 2007 or even £187,796 in 2008. 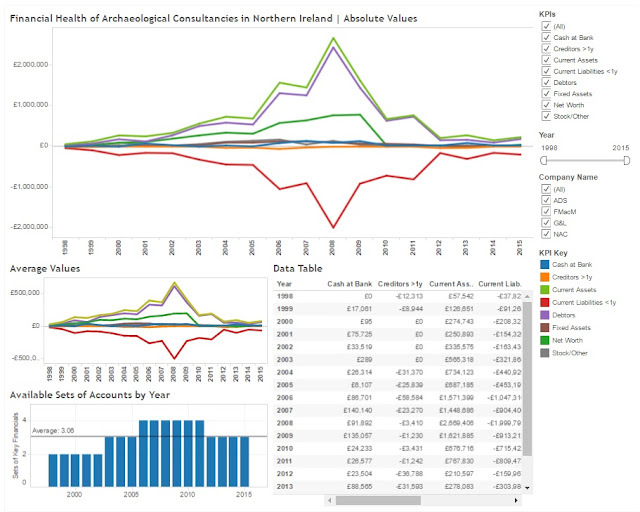 While the overall picture is ever so slightly hopeful for the commercial archaeology sector in Northern Ireland, the individual companies are not contributing equally to that image. The underlying point of this exercise is – as always – to ask how safe and secure are the artefacts and archives these companies hold. This is the physical evidence of our ancient past, part of our shared cultural identity, and the deep history of this land. If one of these went out of business the possible losses to our shared heritage could be catastrophic. We have already seen ADS apparently wind up its operations in Northern Ireland (though their status in the Republic of Ireland appears to be different) with no apparent intervention from the Northern Ireland Environment Agency to protect or rescue material from this jurisdiction. At this time, I have no knowledge of the fate of these items, though I can only imagine that it must be rather perilous if there is no active company involved in their curation. Despite modest (though variable) profitability in the remaining consultancies, their fates and finances of none are secure, and it is likely that at least one could have ceased trading within the medium term. Should this happen, there is absolutely no guarantee that the loss of jobs involved will not be mirrored by a loss of our shared cultural heritage. Once again, we can but wait to see what the 2016 accounts bring … are we witnessing the green shoots or recovery or the death rattle of an entire sector? This is my analysis. It is based on the available figures submitted by these companies in their end of year statements of accounts. However, there may be more in the data that has not registered with me. Please feel free to use the Tableau dashboard below to examine the data in ways meaningful to you and make your own discoveries. If you experience any issues, it is also available on my Tableau Public page: here. Let’s be honest – archaeologists love books … we read books, we write books, we buy books … so let’s have some books! Where better to start than with Marion Dowd’s award winning The Archaeology of Caves in Ireland [Amazon | Oxbow]? It won the Current Archaeology’s prestigious ‘Archaeology Book of the Year’ in 2016. If you don’t already have it … why not? … now’s the time to add it to your collection! While you’re at it, look for Marion’s new book Archaeological Excavations in Moneen Cave, the Burren, Co. Clare: Insights into Bronze Age and Post-Medieval Life in the West of Ireland [Amazon | Archaeopress]. I was lucky enough to receive an early copy as a gift & can thoroughly recommend it! Another great book out there – holding as much interest and delight for the professional as the interested non-specialist – is Neil Jackman’s Ireland's Ancient East: A Guide to its Historic Treasures [Amazon | The Collins Press]. The Collins Press have an excellent selection of archaeology titles available [here]. These include Archaeological Excavations at Tullahedy, County Tipperary: Neolithic Settlement in North Munster by Rose M. Cleary & Hilary Kelleher [my review | Collins Press | Amazon] and Iverni: A Prehistory of Cork by the unmistakable Billy O'Brien [my review | Collins Press | Amazon]. There’s one particular volume that I don’t have in my own collection: Archaeological Networks: Excavations on six gas pipelines in County Cork by Kerri Cleary (just a hint, no pressure) [Collins Press | Amazon]. Recently released by Four Courts Press & just in time for Christmas is William Marshal and Ireland edited by John Bradley, Cóilin Ó Drisceoil & Michael Potterton [Four Courts] ... a prefect gift for the Medievalist in your life! Also for the Medievally-inclined and well worth a look is The Tribes of Galway: 1124-1642 by my old friend Adrian Martyn [adrianmartyn.ie]. Another volume that comes highly recommended to me is Remembering St. Comán - Patron Saint of Ros Comáin by Noel Hoare and is available from the Rathcroghan Online bookshop [here]. If you’re looking to get a bunch of the NRA monographs on the cheap, take a look at this offer: Monographs 1-5 in a bundle! I want to single out one of the new books from Wordwell for special mention: Meitheal. The Archaeology of Lives, Labours and Beliefs at Raystown, Co. Meath by Matt Seaver. This is a long-awaited publication on the Raystown milling centre – a nationally-important site of Early Medieval date. Unfortunately, I’ve only had the opportunity to skim through a few pages in a bookshop, but the little I’ve seen assures me that this is a significant work from a skilled writer and thinker – I look forward to reading more in due course. The aforementioned Neil Jackman also runs the delightful Abarta Heritage which, among other things, have produced a free audiobook to accompany the Meitheal volume. How cool is that? The free audio book is here, but please do go check out their other offerings here. I’d like to take a moment to put in an additional plug for Trevor Rice, a former colleague of mine and exceptional archaeologist, who has spent recent times writing on the early history of Christianity in his series The Christ Illusion. While frequently controversial, Trevor’s writing is always thought provoking and engaging. Each portion is available for £2.29 for Kindle, or free if you have Kindleunlimited, and are high-quality, intellectually challenging reads. 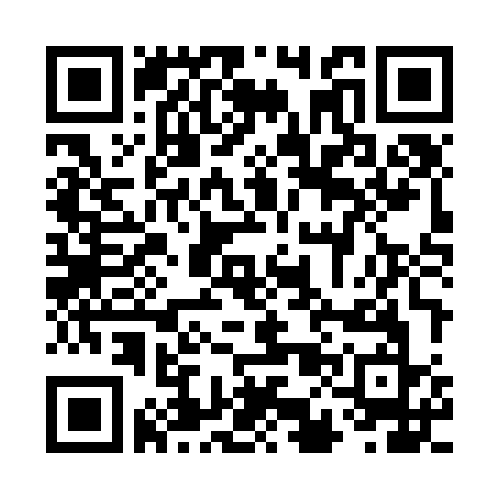 Go take a look! I realise that the above is a pretty formidable selection of books. I’m told that people also like things other than books … I can’t say I fully understand it myself, but there you go! If you’re looking for some truly beautiful reproductions and heritage-inspired pieces, you’ll not do better than Colm Moriarty’s irisharchaeology.ie shop [here]. 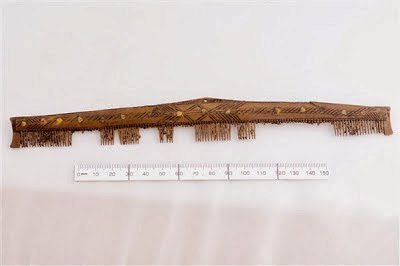 They have so much lovely stuff, but I particularly like the bronze penannular brooch modelled after the original from Ballyspellan, Co. Kilkenny [here]. Nord Emporium is a vendor I’d not previously encountered, but came highly recommended to me [here]. This guy is producing some absolutely stunning items in a range of metals and prices. His website is a joy to behold and while I adore his range of beard beads, I don’t think I’ll be regrowing my facial topiary any time soon. Instead, I would particularly recommend his belts … just gorgeous! Staying with the jewellery theme: Tatjana Kytmannow is the mind and the talent behind Sligo-based Queen Maeve Jewellery. She produces some absolutely gorgeous items, many with a distinctly Elizabethan feel - go give her page a look and send some business her way! Jane Brideson is a wonderful artist who creates sumptuous, richly-detailed images inspired by Irish myth and legend. Take a look at her work on her website: The Ever-Living Ones – you won’t be disappointed! Another new discovery for me was a recommendation for Tillerman Beads. My word, but their beads are delightful! The entirety of their website deserves time to explore and savour, but their historic bead collection in particular is simply wonderful. 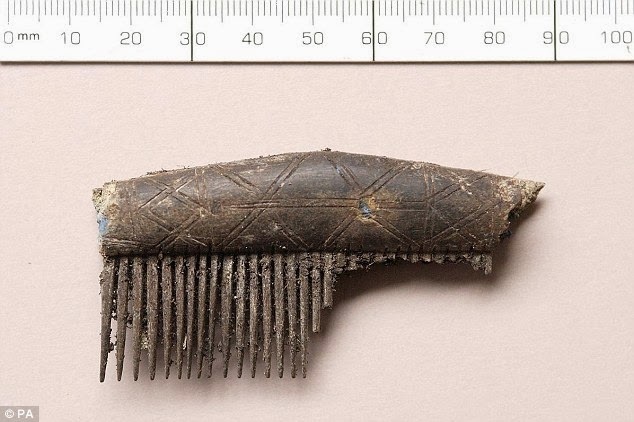 Their Anglo-Saxon and Viking beads are superb … but when they get down to the level of identifying beads by the exact cemetery and grave they were originally excavated from, you know that you’re dealing with something special [here | here]. I’m not terribly sure if I could carry off a full-size Viking replica necklace at my time of life … but I’m willing to give it a go! One of the conversations that came about as part of my original request for suggestions was ‘what drone to buy for archaeological work’ … I have a little drone of my own that, when I have the opportunity, I love to fly about. It has a little camera on it that’s really basic … it’s cheap and cheerful, but no one is going to pretend that it’s suitable for serious archaeological or photography work. The recommendation from a respected archaeological photographer was the Phantom 3 Standard [DJI | Amazon]. True, it’s a bit pricey for me, but if you want high quality photography and a reliable drone, this is the way to go! When I originally asked for advice and recommendations, there was one repeated Christmas Wish from archaeologists. Some put is seriously, while others phrased it in more comic terms, but the core message was the same: lots of people would like a job that pays the rent! It wouldn't seem like a terrible lot to ask, but the archaeological sector remains fragmentary, and poorly paid. I'd love to have a link to click on where you could purchase that kind of happiness and security, but it's not that simple, is it? Maybe not. However, the best advice I can offer here is for every archaeologist still practicing on this island is to join the archaeological branch of the Unite union. Start by going to the Unite Archaeologists - Digging for a Living Wage Facebook page, then watch their video, then go to their Website and click on the link to join the union [here!]. If you want a future in Irish archaeology, this is the best chance you have of seeing it. Give yourself the gift of still having a career next Christmas ... join Unite ... do it today! Whoever you are, wherever you live, and however you celebrate this season at the fag-end of the year, I hope you have a great one, filled with peace, harmony, and joy ... and maybe a few gifts off this list! Have a Happy Whatever Doesn't Offend You! PS ... want to help me have a good Christmas? If so, please consider dropping something in the Tip Jar on the top right or using the Amazon search portal in The Reading Room section. Each product bought in this manner generates literal pence for me and costs you nothing! PPS ... did I miss something? Something an archaeologist would love? Something that an archaeologist is selling? Let me know & I'll add it in as an update! PPPS ... It's not yet published but Margaret Hickey's Ireland's Green Larder promises to be an excellent read and a great collection of food lore and cooking experiences. Maybe not one for Christmas this year, but a pledge of even £10 could go a long way to helping this volume see the light of day! Check out her page on unbound.com. * It’s true! I don’t celebrate Christmas. 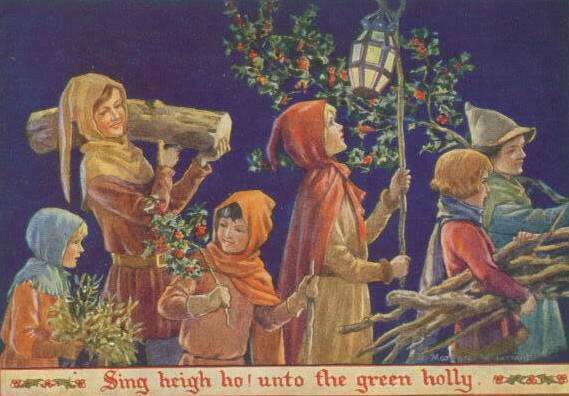 Instead, I celebrate the traditional feast of Yule. It encompasses all the best bits – feasting, gift-giving, bringing random bits of greenery indoors, but without all the tedious stuff like praying and getting up to go to church. If that sounds like what you do for Christmas, you might be accidentally celebrating Yule too!